Inlays and onlays are fillings placed in the crown of a tooth. Usually, we use them in the case of the loss of the large amount of the structure in the back of the mouth, resulting from caries or during root canal treatment. Inlay / onlay is an alternative solution for white fillings made with the traditional method. These types of fillings allow for precise reconstruction of the anatomical shape of the tooth. Onlay / inlay looks like one-piece filling, however due to the fact that they are usually made of porcelain, inlay / onlay is more durable and aesthetic than composites. During root canal treatment a lot of hard tissues, ie. the crown of the tooth, are lost. As a result, the crown of the tooth is deprived of a significant part of hard tissue, somewhat empty inside. After endodontic treatment it is necessary to rebuild the tooth as soon as possible, mainly due to the high risk of breaking the weakened and empty tooth crown. Only tight and durable restoration prevents secondary infection of the canals and mechanical injuries of the treated tooth, for example, cracking or breaking the crown of the tooth or even the root. Reconstruction with a composite material, if the side walls of the tooth are kept in good condition and in the right amount. 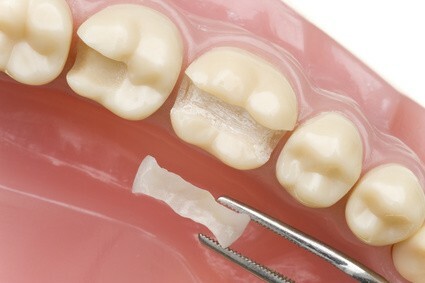 Then we use a typical composite white filling for the tooth reconstruction. However, in most cases, after root canal treatment, it is no longer possible to rebuild the tooth crown with a composite material. Porcelain inlay / onlay, when there are large missing tooth structures after root canal treatment. The tooth rebuilt thanks to inlays and onlays is resistant to abrasion, and to this faithfully reproduced, mainly due to the precise reproduction of anatomical structures. Reconstruction with fiberglass insert and all-ceramic crown cemented on it. The crown is the most durable solution after root canal treatment, recommended to our patients after root canal treatment. We always choose the crown individually and adjust it to the anatomical conditions in Patient’s mouth. After it is done, the tooth looks natural, aesthetically and can not be distinguished from the others. The tooth rebuilt thanks to inlays and onlays is resistant to abrasion, perfectly reproduced, especially thanks to the precise reproduction of anatomical structures. they are suitable for the reconstruction of large structures.